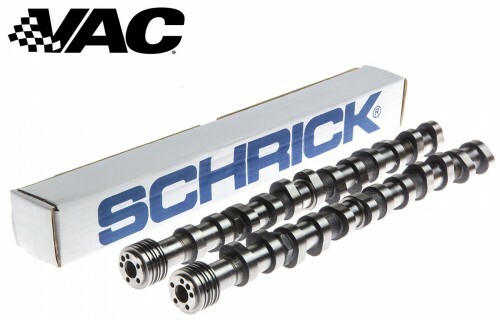 AVL Schrick GmbH or 'Schrick' for short, manufacturessome of the finest M10 camshafts money can buy. As both an OE manufacture, as well as performance tuner; Shrick is literally the pinnacle of BMW performance. All cams are ground from new premium-quality blanks, never re-grinds. This eliminates one of the most common issues with rocker arms, and geometry issues that can sometimes plague reground cams and cause rocker arm failure. By working with the highest level professional racing teams, such as in Formula 1, NASCAR, ALMS, and OEMs throughout the world, Schrick is at the forefront of camshaft technology and development. This ensures you make the most power possible while also keeping reliability under all conditions. Just because the M10 is old, doesn't mean its forgotten... Far from it! We sell these cams to enthusiasts and vintage racers all over the world. When a customer wants to get the best performance for there M10, Schrick's premium camshafts are the first choice. Schrick 284° grind: Good lower RPM torque and mid range gains with a mild increase in high RPM power. Excellent daily driver cam & works well with all OE fuel systems, and even better with the popular 32/36 Weber DGV carburetor or Kugelfischer. Direct drop in replacement with no piston to valve clearance issues. Schrick 292° grind: Great mid range and total RPM band power, all without making the low RPM response sluggish. A favorite of many that works with 32/36 downdraft or small (40s) sidedraft carbs best. Schrick 316, 328, 336°grinds (Billet Cam) Race use, the choice of M10 racers around the world for reliable and excelent high RPM power. For fully modified, high compression engines with side-drafts or aftermarket fuel delivery. Not recommended for street use. Please be aware of high stresses to rocker arms. Don't be fooled by other retailers who don't update: We keep all Schrick cams in-stock and keep all pricing up to date. For all M10 applications, (1600, 2002, 320i, 318i, ect). Select clockwise or anti-clockwise based on the distributor gear you will be using. -All M10s are well over 20 years old; VAC highly recommends upgraded valve springs and retainers with all performance camshaft upgrades to protect against mis-shifts and over revs. -Installing cams is also an ideal time to install new rocker arms. New rockers are highly recommended when using a new camshaft. -304 cam needs a small notch ground into the center camshaft journal. -316 Degree and larger will require align bore for installation. -328 and up camshafts present extremely high stresses to rocker arms; we highly recommend our race grade VAC rocker arms for 328 and 336 cams.